(CBS/AP) LOS ANGELES - Redmond O'Neal, son of the late actress Farrah Fawcett and actor Ryan O'Neal, escaped jail time on a drug charge. Instead, he was ordered to spend a year in a live-in rehab after pleading no contest Wednesday to heroin possession and to being a felon in possession of a firearm. 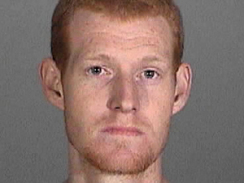 Los Angeles Superior Court Judge Keith Schwartz also sentenced the 26-year-old O'Neal to serve five years on probation. If O'Neal violates his probation he could face up to three years in prison, according to District Attorney Spokeswoman Jane Robison. Police say O'Neal was arrested in Santa Monica Aug. 2 when an officer pulled him over for running a red light and discovered heroin after searching the vehicle. The arrest came as nothing new to O' Neal, who has battled addictions since his teens. He has also been in and out of jail and rehab centers for crimes related to substance abuse. Attorney Richard Pintal, who represented the younger O'Neal, says the sentence recognizes that his client is facing serious addiction and medical issues and that treatment was more appropriate. Ryan O'Neal attended his son's sentencing Wednesday.